1.1 WHICH IS THE BEST DIET FOR OSTEOPOROSIS? 1.4 What foods are best suited for osteoporosis? 1.6 Are spinach rich in calcium? WHICH IS THE BEST DIET FOR OSTEOPOROSIS? A proper diet can help prevent osteoporosis or delay its onset. In general, we can say that a diet rich in calcium and vitamin D promotes the absorption of this mineral in the bones or prevents the loss of it,favoring its absorption. This is the reason why you should include at least three servings a day of foods rich in calcium. Vegetal natural foods are the best for this diet, combined with milk or its derivatives and bluefish. Taking the sun 15 minutes a day (the body can produce vitamin D from the sun’s rays). Foods with probiotics help improve the intestinal flora and absorption of previous nutrients. What foods are best suited for osteoporosis? The main source of calcium is milk. But whole milk has a lot of fat so not very suitable from certain age. It is best not to give it up and take skim milk. Its derivatives should also be skimmed. Dried fruits are very rich in calcium, to such an extent that them can be used like substitutes of milk by those people who have intolerance to the lactose or those people who choose an ovo-lacto vegetarian diet and do not wish to eat oily fish which is also very rich in calcium. Ingestion of these fruits is a good way to maintain bone health by preventing osteoporosis. For the young, the consumption of these foods can help strengthen bones and promote proper growth. Among the richest food in this mineral we would highlight the almonds (240 mg / 100g) maca (220 mg /100g) Brazil nuts (170 mg / 100g) hazelnuts (140 mg / 100g) or pistachios (110 mg / 100g). Therefore, except in problems of obesity, people with osteoporosis should consider the option to introduce nuts into their diet. There are some edible wild herbs herbs rich in calcium. Among them, amaranth or pigweed (Amaranthus) is one of the best. It can be eaten boiled or you take its broth. Purslane (Portulaga oleracea), another wild grass, with various medicinal properties can be added to salads and provides a good dose of this mineral. Other herbs rich in calcium are marjoram or basil. Another important mineral that should not be overlooked is the magnesium is also involved, along with potassium in bone formation. Although it should be taken in a proportion of 50% compared to calcium, is also very important for the formation of teeth. Thus, while the lowest dose of calcium is set at 700 mg daily, magnesium one is 350 mg daily. Are spinach rich in calcium? Spinach and chard are rich in calcium but contain oxalates, which prevent the assimilation of it. Therefore, these vegetables have a lot of calcium but have a low assimilation of it. To be able to assimilate the calcium of these vegetables it is convenient to combine them with dairy products in the same food, or boil them (Once boiled, discard the broth). * Related information: The acai pulp and the acai juice are two food products very rich in calcium (as well as milk) that can be found in America. After calcium, magnesium is the second most important mineral in the diet to take into account in the diet for osteoporosis. 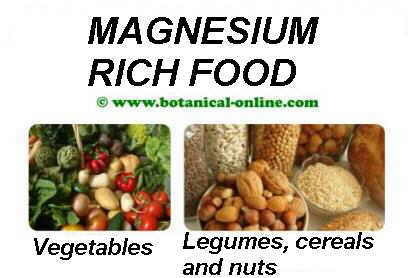 Green leafy vegetables, legumes, cereals and nuts are very rich in magnesium. Magnesium intervenes, along with potassium, in the formation of bones and teeth. This mineral helps to alkalize the diet and counteract the excess of phosphorus in the body, which is decalcifying. This mineral must be ingested in proportion of 50% with respect to calcium. Generally, vegetables rich in calcium are also rich in magnesium, so it is easy to combine these two contributions. Thus, while the minimum dose of calcium is set at 700 mg. daily, magnesium daily dose is set at 350 mg.
Foods rich in magnesium are: dark green vegetables, such as cabbages, spinach, etc. Hemp seeds are very rich in magnesium. Almonds, algae, oats, peas, lentils, lettuce, wheat, asparagus, squash, potatoes, etc. are also good sources. The main function of vitamin D is to set the dietary calcium in the bones and prevent its dissolution in the blood, going to the muscles and nerves. 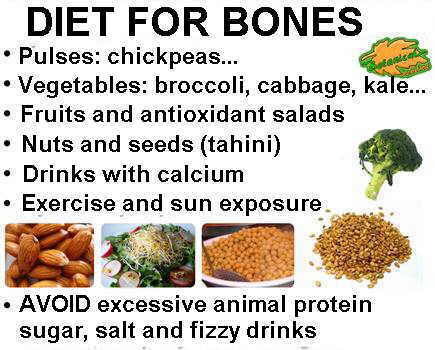 If this occurs, each time bones have less calcium and become weak and brittle. 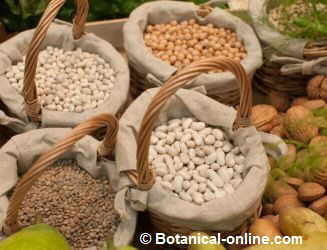 Vitamin content in these products is very high, so that today we tend to add it in many of them. Each liter of fortified milk typically has 400 IU of this component. Cheese and yogurt do not usually carry it, so that they practically do not contain it. Vitamin D in food is known as vitamin D2 or ergocalciferol. Plant foods contain negligible amounts of this vitamin. To fill this gap many packaged cereals have been added with vitamin D.
A way to acquire vitamin D without resorting to animal foods is to take it by means of supplements. Protein is needed to keep bones and muscles in good condition. However, it has been shown that excess animal protein it is not useful for osteoporosis. Quite the contrary, a very high meat intake contributes to the softening of the bones since it expels the calcium through the urine. Omega 3 fatty acids help prevent osteoporosis by a dual mechanism. On the one hand, They prevent the removal of calcium through the urine and, moreover, they increase their absorption. Foods rich in this component are oily fish (sardines, mackerel, herring, tuna, etc.). These foods also provide a good dose of vitamin D. Small-sized fish such as sardines or mackerel are recommended, since they contain less mercury than large fish such as salmon or fish. 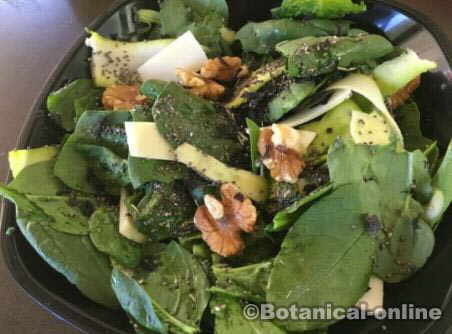 Those who prefer to acquire these components from a vegetarian diet will have to do through olive oil, avocado, 7 walnuts daily, rapeseed oil, flaxseed meal, ground chia seeds, nuts in general (nuts are the richest in these acids), seeds like hemp or linseed. – Diets rich in animal proteins that produce the expulsion of calcium through urine or highly acidic foods diets. – Alcohol, because it causes bone loss. – Coffee, tea, or cola. The caffeine in these drinks causes calcium loss from the body that is expelled expel through urine. – Carbonated beverages. In the same way that some treated meats as ham or pâté, they contain phosphate-wasting calcium. – Salt because, along with the protein contributes to calcium loss, by inhibiting the absorption of vitamin D. Also avoid canned foods because they have too much salt. – Bran, because it inhibits the absorption of calcium. – Vegetables with oxalates. These include spinach or beet. Oxalates do not let our body to absorb all the calcium so it is wise to eat these foods with moderation.